Thyroid diseases are among the most common of the endocrine disorders, affecting approximately 13 million Americans, according to theAmerican Thyroid Association. 1 For patients with suspected thyroid dysfunction, the diagnostic work-up generally includes a scan of the thyroid gland and a thyroid uptake study. As healthcare facilities continue the migration to a digital and PACS environment, imaging studies are more commonly being stored in an electronic format.Most thyroid uptake study results, however, are still presented on paper.Capintec, Inc. (Ramsey, NJ) recently added a DICOM compatibility feature to its Captus 3000 Thyroid Uptake System, which will allowimaging facilities to electronically view and store thyroid uptake study results along with the scan results. The Captus Thyroid Uptake System, which has been on the market for approximately 20 years, was designed to measure and quantify thyroidfunction and aid in the diagnosis of thyroid disease. "It is used mostly in nuclear medicine departments," said John Viscovic, Vice President, Domestic Sales and Accounts at Capintec. 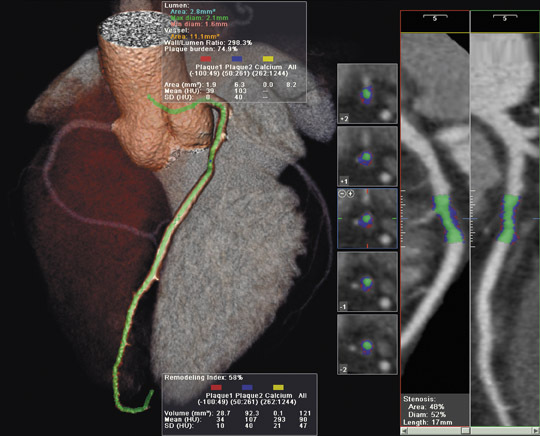 "But there are also some cardiologists and mobile imaging units that use this equipment. Its basic functionality is to quantify thyroid function, and this is done by measuring the current and residual activity of iodine (I)-123 and I-131." The company's &#64258;agship system is the PC-based Captus 3000 Thyroid Uptake and Well System (Figure 1). "We also have the Captus 600,which is a microprocessor-based unit," Viscovic said. "Of course, the PC-based unit is more popular. It's somewhat easier to work with and,because it is built on a PC rather than a microprocessor, it allows the user to save more data and can run additional types of programs thatthe microprocessor-based system cannot." The system features two 2-inch NaI detectors and &#64258;at-field collimation. The 1024 Multichannel Analyzer (MCA) module allows for measurement of energies up to 2 MeV and contains a library of >90 preloaded isotopes. Its computer features a 1.6-GHz processor with a 20-GB hard drive, a color monitor, keyboard, trackball, and color printer. The standard system configuration includes a mobile stand, thethyroid uptake probe, and the drilled crystal well. It is also available in a tabletop version, a version that includes a well counter, and a wall-mounted version. The system allows the user to set multiple protocols for studies using I-123, I-131, and technetium-99m (Tc-99m) using a standard capsulemethod or through an automatic decay correction for the administered dose. Prior to the examination, the patient is given the radioactive iodine;he or she is then asked to come back for studies at either 4 or 6 hours and again at 24 and 48 hours. "For the patient," Viscovic said, "the experience is pretty easy.The doctor and the physicist at each individual facility determine the specific timing of the studies. Each facility will haveits own preferred protocol, but patients are usually asked to come back at either 4 or 6 hours and then again at 24 and 48 hours." Once the study is complete, the findings are presented in a Thyroid Uptake Report with detailed count information and automatic percentageuptake calculations. All findings outside defined normal ranges are &#64258;agged within the report. The company recently added optional DICOM compatibility to the Captus 3000. With this software, known as Cap-DICOM, the thyroiduptake results are presented in a DICOM-compatible image format that can be viewed at any workstation and can be stored on the PACSsystem.The software creates a DICOM-compatible secondary capture image that includes all the information generated during the uptake study. This information is then merged with the thyroid scans and displayed as a DICOM image. This combined report can then be exported to a workstation or stored on the PACS. "CAP-DICOM allows patient data from the Captus to be saved and viewed on the DICOM and PACS system," explained Viscovic. "The way it works is this: A patient comes in for a thyroid uptake and scan. The scan is done on a gamma camera. Today, in most departments, all the images are saved on the DICOM server and viewed on a PACS viewer. In order to simplify the process, we can now capturethe data from the Captus uptake and make an image out of it. We then have the image sent over to the DICOM and saved there. Theseresults can now be viewed with the actual thyroid gland images on any PACS viewer on the network." In addition, the DICOM compatibility software allows the system to interface with the hospital information system (HIS) and/or radiologyinformation system (RIS) and pull patient data from the database. "This also allows the patient data to be imported into the Captus database,"he continued. "So this way, if you were to go in and get a thyroid uptake done, the tech could simply call up your information from the DICOMserver and load it directly on the Captus. There doesn't have to be any manual input. The screen gets automatically populated. It captures allpatient demographics: name, date of birth, doctor, dose--everything is captured on that screen. This helps to cut down on mistakes." With thissoftware, the user is able to query the worklist by accession number, patient ID, patient name, or date and can correct any patient information,if necessary, before exporting the data. The DICOM compatibility also helps make the report more portable, according to Viscovic. "In the past, the information from the Captuswould have been presented in an uptake report on 3 or 4 sheets of paper. This document would then be saved with the hard copy film of thethyroid gland. Considering that everyone is going digital so that everything is being saved with the DICOM and viewed on the PACS, theadded DICOM functionality helps to further alleviate the need for paper." Other features of the Captus system include a "Quick Start" instruction module. This feature takes the technologist through the basic tenets ofthe system. "It's a demo that the techs go through and it quickly allows the techs to start utilizing the Captus without having to have someone sitwith them and take them through each and every step," explained Viscovic. "The 'Custom Protocol' feature allows techs and doctors to establish their own protocol and template for how they want to do the uptakestudies," he added. "Some physicians like to bring the patient back in 4 hours, some like to bring the patient back in 6. Some do only 24-hourrepeat studies; some do 24- and 48-hour studies. This feature lets the user customize the protocol. It's very easy to learn and it's very intuitive." The Captus 3000 also features a new software package that enables the system to perform a variety of additional tests, including QualityAssurance, Wipe Testing, Bioassay, Multichannel Analyzer and Lab Tests, including Schilling, Red Blood Cell (RBC) Survival, and I-125 andChromium-51 (Cr-51) Blood Volume. "The Captus' main purpose is to determine the functionality of the thyroid, but it also does wipe tests, Schilling tests, red blood cell survival, and bioassay," said Viscovic. "You can use the Captus for bioassay, for monitoring your personnel, as well as other custom protocols for additional applications that are not as commonly used in nuclear medicine." For wipe testing, the program performs an automatic peak and isotope identification of wipe results using either pre-set or user-definedtrigger levels. The system then maintains the results history in a printable format. The bioassay feature allows the system to be used to measure staff thyroid burden for I-123, I-125, and I-131. Cumulative histories can be maintained on the system or via hard-copy printouts for regulatory requirements. "There are quite a few things the Captus 3000 can do," concluded Viscovic. "The optional Cap-DICOM software really helps to cut down ontime and paper, and it simplifies things within the department. As a company, we had discussed this a few years ago, but we waited a little whilebecause PACS was not yet in the mainstream at that time. Now that even smaller community hospitals are moving to PACS and doing away withhard film, we decided that it is now a really good time to add this functionality." American Thyroid Association. About the ATA: Press Room. Available at: http://www.thyroid.org/ about/pressroom.html. Accessed May 9, 2008. Technology and Industry: Thyroid uptake in the PACS environment. Appl Radiol.